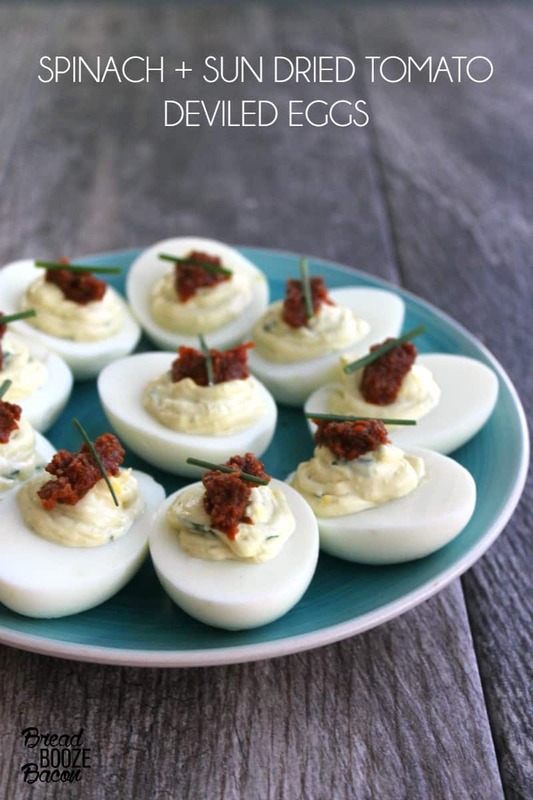 Three of my favorite flavors come together for a crave-able little bite in these Spinach & Sun Dried Tomato Deviled Eggs! 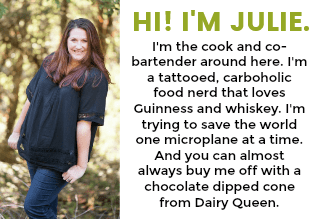 Ready to have a sharing kind of day? I like you and feel like I can let you in on a not-so-secret. 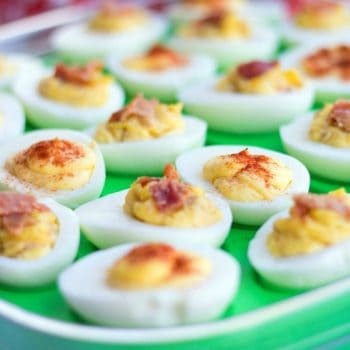 I’m a deviled egg whore. They’re one of my obsessions. 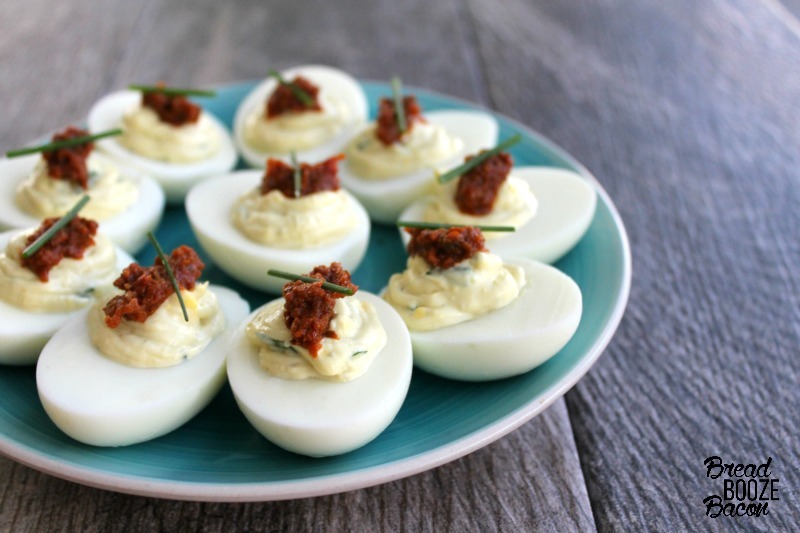 If great deviled eggs are in the room I want to eat all of them, not share, and feel no guilt for taking the last one from the plate even if you didn’t get a single one. You should have moved faster kid. What’s not to love? They’re edible bowls with creamy dreamy egg yolk filling you can turn into a million different flavor combinations. 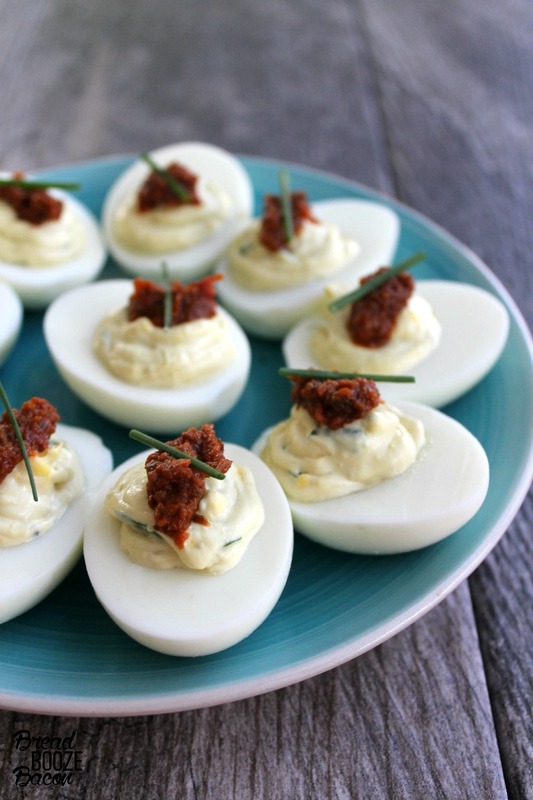 Or, go old school with a little mayo and paprika and you’re in appetizer heaven. Am I right?! 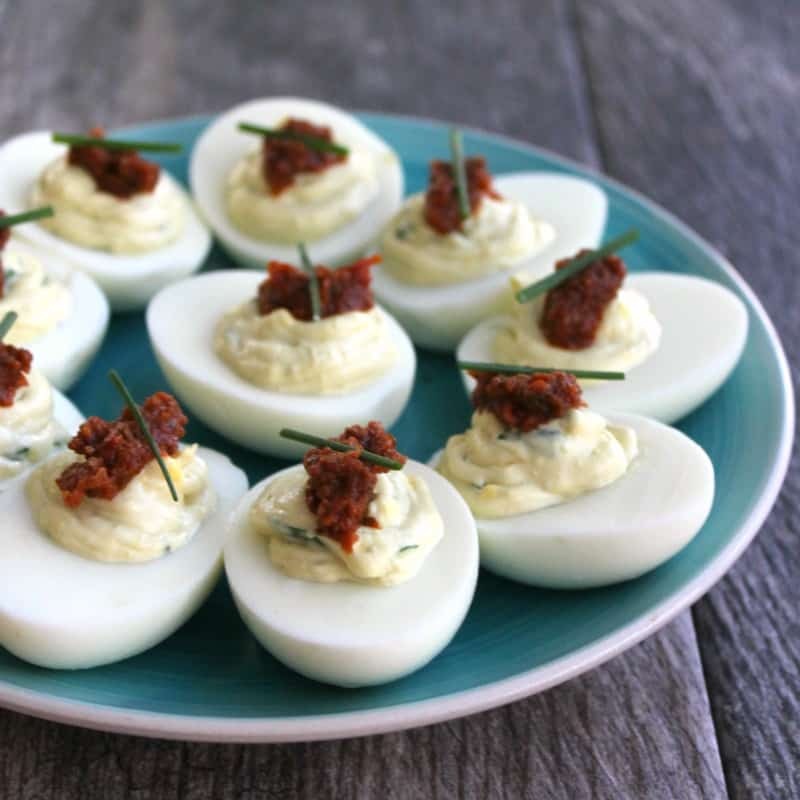 Try our Bacon & Roasted Garlic Deviled Eggs! Cut each hard boiled egg in half vertically, so that you have two symmetrical pieces. Use a spoon to gently remove all the yolks. Add the spinach to your yolk mixture, and stir to evenly combine. Season with salt and pepper, to taste, and stir once more. Transfer yolk mixture to a piping bag with a end cut off (or ziploc bag with one bottom corner cut off). Carefully move the yolk mixture down to the end of the bag, and then squeeze enough yolk mixture into the cavity of each egg to fill it. 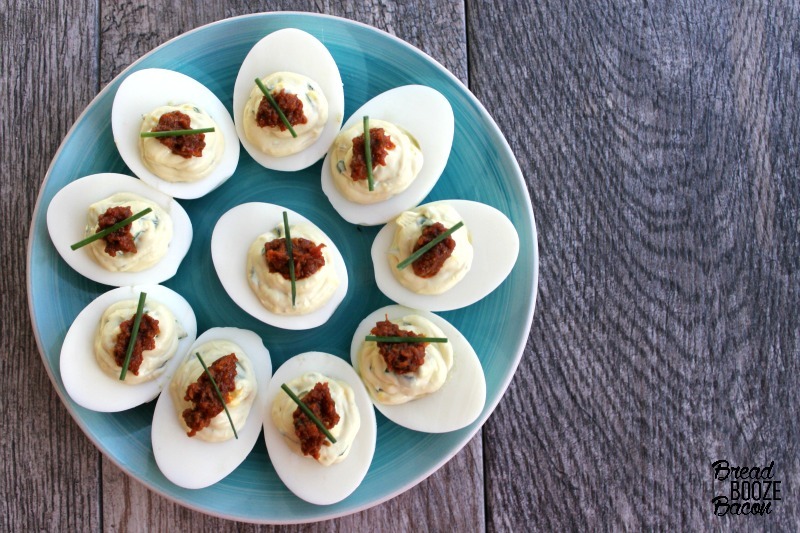 Garnish each egg with a small dab of sun dried tomato pesto (just under 1/8 of a teaspoon - the pesto has a very concentrated flavor and is potent. AKA a little goes a long way) and place one chive on top of each egg. 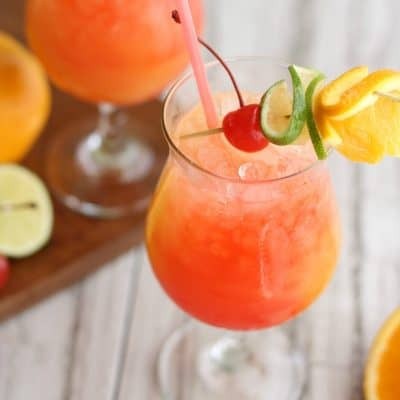 Cover and keep refrigerated until ready to serve.